The Late RSM JJT (Jim) McManus, CD, Cdn Gds | Centre-Arch Inc.
Mr. McManus joined the Cameron Highlanders of Ottawa (MG) in 1937 as a member of the Non-Permanent Active Militia (“NPAM”) at the age of fifteen. Mr. McManus had the opportunity to serve as a member of the Guard of Honour to King George VI, on his visit to Ottawa in the spring of 1939 and on a Special Detail to the Queen during the Trooping of the Colours on Parliament Hill during the same Royal Visit. In August 1939, Mr. McManus successfully completed the Sergeant Qualifying Course – Part 2, at St. Jean, Québec. 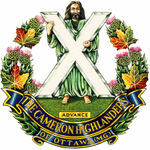 On September 2, 1939, the Cameron Highlanders were ordered to War Establishment and Mr. McManus, at the age of seventeen, voluntarily enlisted for the Active Service Force and was promoted to the rank of Sergeant. —Camerons depositing of the Colours to St. Giles Church in Ottawa, May 12, 1940. Sergeant JJT McManus is on the far right. 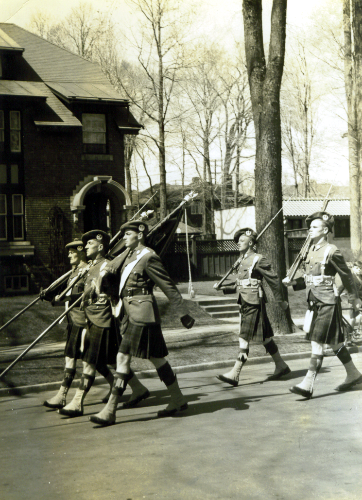 During the fall of 1939 and the spring of 1940 the Cameron Highlanders trained in Ottawa and at Camp Borden, before departing from Halifax for Iceland in July 1940. Mr. McManus was a member of the Guard of Honour for the Colour Party when the Cameron’s Colours were laid up at St. Giles Church, Ottawa on May 10, 1940, prior to the Camerons departing for Iceland. Jim left for Iceland on the Empress of Australia, out of Halifax harbour. This was the same ship that had brought the King and Queen to Canada for their 1939 Royal Visit. The Empress of Australia had not yet been converted to a troop ship, and as such, still had their crew and first class cabins, so it was a very enjoyable journey to Iceland. In January 1941, Mr. McManus attended the Infantry Machine Gun Course at the British Small Arms School at Netherhaven and was subsequently promoted to Warrant Officer Class Two (“WO2”) and appointed Company Sergeant Major (“CSM”) of ‘C’ Company, Cameron Highlanders. The Camerons, with three machine gun companies and one heavy mortar company became the support battalion for the 3rd Canadian Infantry Assault Division. Mr. McManus landed in Normandy on D-Day – June 6, 1944 – with ‘D’ Company, the heavy mortar company in support of the Canadian 7th and 9th Brigades. As the Canadian Army advanced through North-West Europe, Mr. McManus participated in the Liberation of Holland and ended up in Germany at the cessation of hostilities on May 7, 1945. 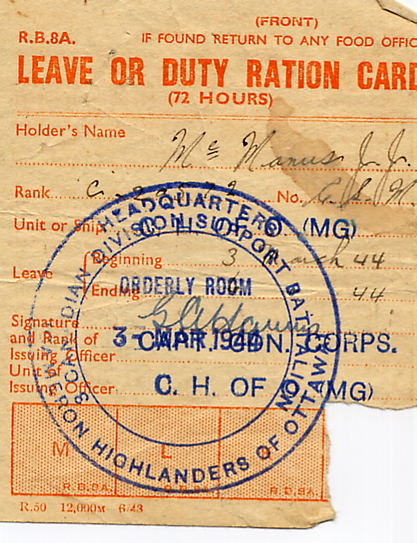 After the surrender of Germany, the Camerons’ Third Battalion formed part of the Canadian Army Occupation Force, and Mr. McManus was promoted to Warrant Officer Class One (“WO1”) and appointed Regimental Sergeant Major (“RSM”) of the 3rd Battalion of the Cameron Highlanders, making him one of the youngest RSMs in the Canadian Army at the age of 24. He served in Germany until June 1946, when the Regiment returned to Canada. Subsequently, Mr. McManus was accepted into the Canadian Interim Force, as a Warrant Officer Class Two (“WO2”) and appointed a Company Sergeant Major (“CSM”). He joined the Royal Canadian Regiment (“RCR”) and was posted to the Officer Training School in Brockville, in October 1946. CSM McManus earned his parachute wings in September, 1948 at Rivers, Manitoba. In 1949, the RCR was designated as an airborne unit. Against the backdrop of the Korean War, and at the age of 28, Mr. McManus was promoted to WO1 and on 09 August, 1950, he was appointed the first RSM of the newly formed 2nd Battalion of the RCR – an appointment he would hold until 26 August 1953. The battalion was slated for duty in Korea and trained at Fort Lewis, Washington before sailing for Korea on 20 April 1951 and landing on 05 May 1951. By mid-May, the Battalion had been ordered into action at the front. Mr. McManus was responsible for defensive stores and supply coordination within the Battalion, which involved supervising the Korean Service Corps, who were instrumental in re-supplying the troops at the front. On 25 May, in the P’och’on Valley, on the approaches to the “Iron Triangle,” 2 RCR was in action for the first time as it attacked an enemy held high feature known as Point 407. 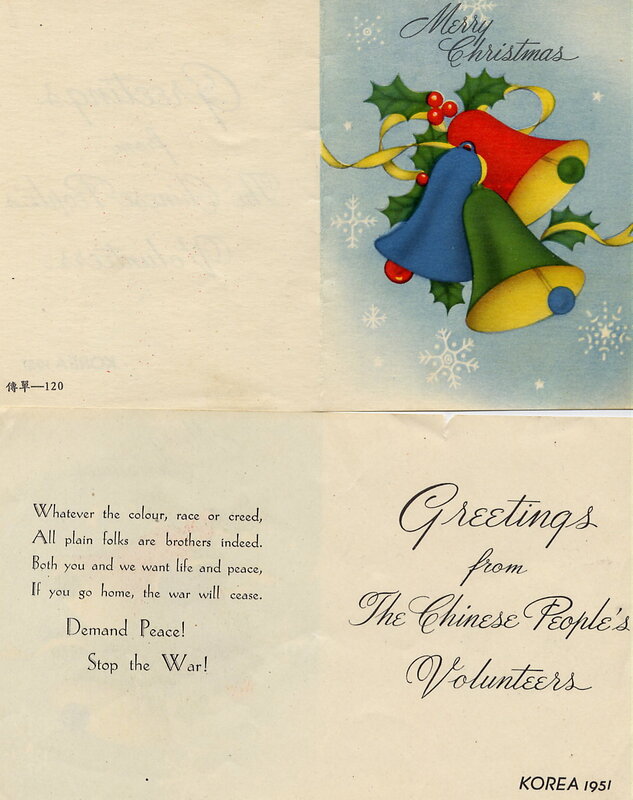 This engagement with the Chinese was followed closely by the Battalion’s epic clashes with the enemy at the village of Chail-Li on 28 May and at Kakhul-Bong Spur on 30 May. The conflict would now settle down into a prolonged, static phase of defensive warfare that would last virtually until the armistice in July 1953. 1 RCR arrived to formally relieve 2 RCR on 24 April, 1952, and 2 RCR was moved back to Seoul and then Pusan, before being ferried to Japan and the 25th Reinforcement Camp at Kure. Upon their return to Canada, 2 RCR officially reformed at Petawawa on 29 July, 1952 and on 12 January, 1953, 2 RCR was moved from Petawawa to Wolseley Barracks in London, Ontario. 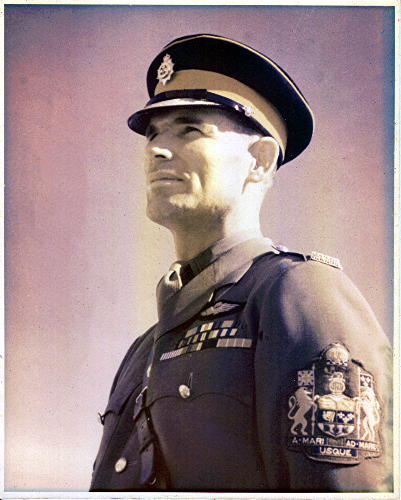 Mr. McManus remained as RSM of 2 RCR until 26 August 1953. 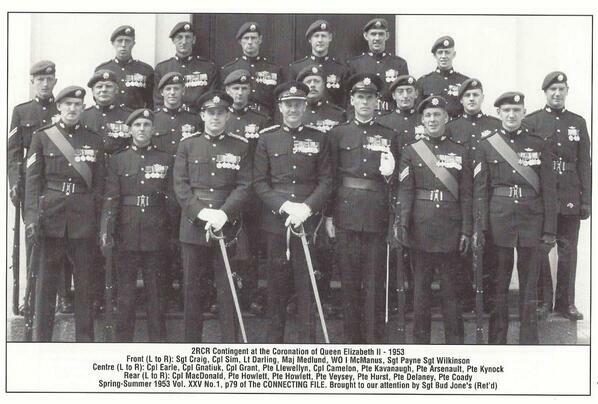 In early 1953, 2 RCR was selected to provide the Regimental representation for the Canadian Coronation Contingent, and Mr. McManus was appointed the Regular Force Sergeant Major of the Canadian Army Contingent to the Coronation of Her Majesty, Queen Elizabeth II, in London, UK on June 3, 1953. 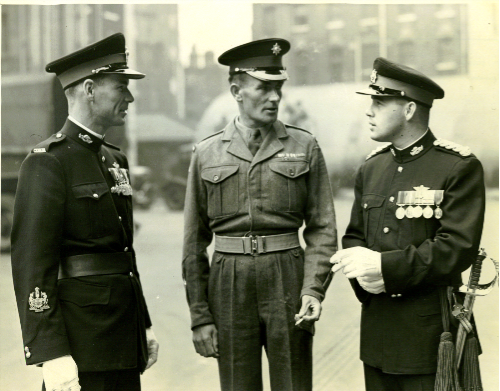 —During the Coronation appointment…RSM JJT McManus, CD, Cdn Gds, with Drill Sergeant Moriarty of the Irish Guards, and Lieutenant Carm Darling of the Royal Canadian Regiment (circa June 1953). The Royal Canadian Regiment, the senior infantry regiment in the Canadian Army at the time, has an appropriately long and close connection with the royal institution. Since its creation, The RCR has participated in every royal coronation. 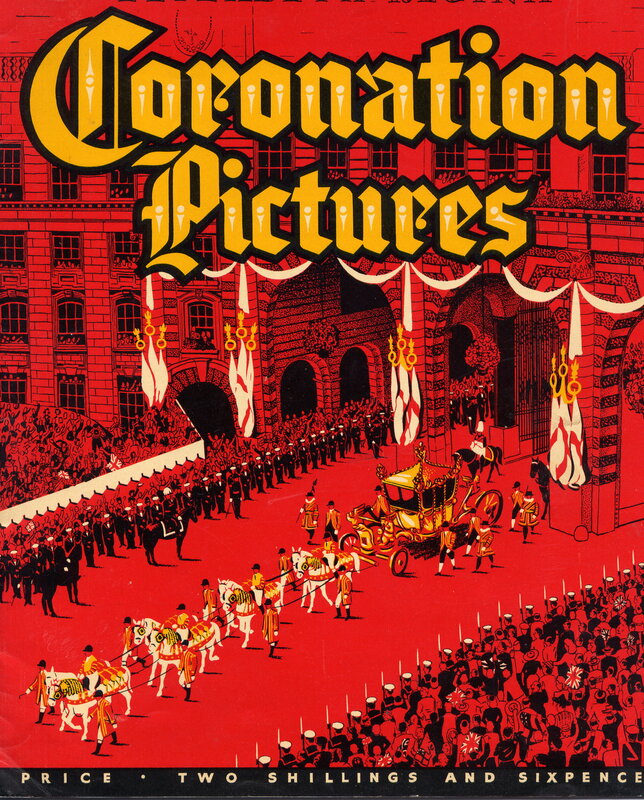 The Coronation of Queen Elizabeth II, on 02 June 1953, would be no exception. On this occasion, as in 1937 for the coronation of George VI, the Regiment’s contingent would be part of a much larger official Canadian Coronation Contingent. The Canadian contingent would consist of some 900 personnel. These personnel were to be drawn from the Royal Canadian Navy, the Canadian Army, the Royal Canadian Air Force, and the Royal Canadian Mounted Police. Prior to sailing for England, the Canadian Coronation Contingent was assembled at Valcartier Camp, near Quebec City. On 29 April the contingent sailed from Quebec City aboard the Cunard Line vessel, Franconia. A physical fitness programme was instituted during the trans-Atlantic voyage to insure the men didn’t put on weight. Arriving at Liverpool, the contingent then traveled by train to London. Their eventual destination was Pirbright Camp, Surrey, near Aldershot. Two days prior to the Coronation Procession, which was to take place on 02 June, the contingent was moved to Kensington Gardens Camp in London and placed in tents along the Round Pond. On 03 June, the day following the procession, the members of the Canadian Coronation Contingent were at Buckingham Palace, in the gardens, to receive their Coronation medals from the hand of Queen Elizabeth II. Just two days later the Canadian Coronation Contingent received the signal honour of mounting the Queen’s Guard at Buckingham Palace and at St. James Palace, from 05-06 June 1953. On 15 June the Canadians were at the naval base of Portsmouth, aboard the Canadian aircraft carrier, HMCS Magnificent, to watch the Queen’s review of the British fleet off Spithead. This marked the culmination of the Canadians’ participation in the Queen’s Coronation. The next day, 16 June, the contingent was sailing for home from Southampton. On 16 October, 1953, a new, national regiment was formed by the Canadian government called The Regiment of Canadian Guards. As personal household troops to the Sovereign, their colonel-in-chief, the Guards became the Senior Canadian Infantry Regiment. 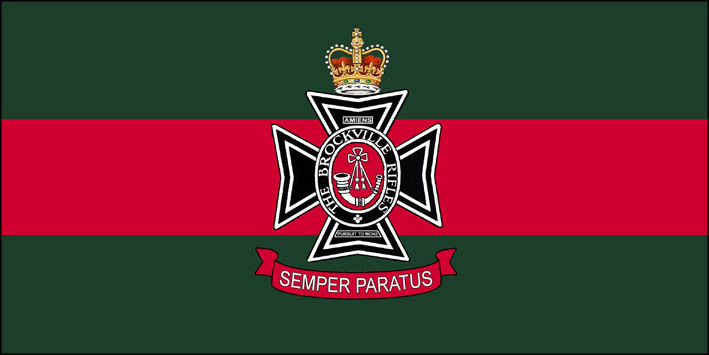 After a three month attachment to the Brigade of Guards Depot at Caterham, UK from 2 July 1954 to 16 August, 1954, Mr. McManus was appointed the first RSM of the Canadian Guards Depot, which had been officially established on September 1, 1954 and became operational on 18 September. Mr. McManus held this appointment he held until 11 June, 1961. Major T. M. MacDonald was appointed Commanding Officer of the Depot, and Captain D. R. Brochu, the Depot Adjutant. 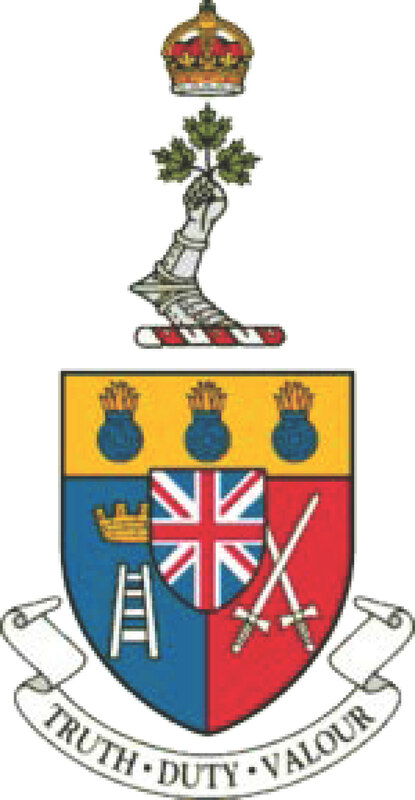 The Regimental Depot had four functions: (a) to train recruits; the first recruit arrived on 22 February 1955 and completed his Depot Stage 7 week training on 18 May, which was followed by a 12 week Recruit Stage , (b) to conduct Junior NCO and other leadership courses, (c) act as a Regimental Headquarters, and (d) administer the Regimental Band, which was formed on 22 April 1954 from its former identity as the 1st Canadian Infantry Battalion Band. Most important, it had to establish the standards of training and discipline by which the Regiment would be judged by its peers. During his time with the Regiment of Canadian Guards, Jim participated in an episode (circa 1956/1958) of the US Army Show, THE BIG PICTURE, which was titled “A Salute to the Canadian Army.” Filmed in Quebec City, Canada by U.S. Army Signal Corps, the episode had its world premiere on October 28 at 9:30 P.M. over the coast-to-coast facilities of the Canadian Broadcasting Corporation. —Air Commodore Leonard Birchall, CM, OBE, DFC, O. 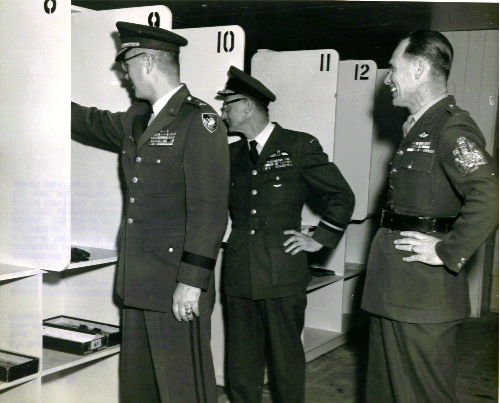 Ont., CD – “The Saviour of Ceylon” (centre), Commandant of RMC and RSM JJT McManus, CD, Cdn Gds, Regimental Sergeant Major of RMC (right) with the West Point Commandant (left) during the West Point Weekend, March, 1966. 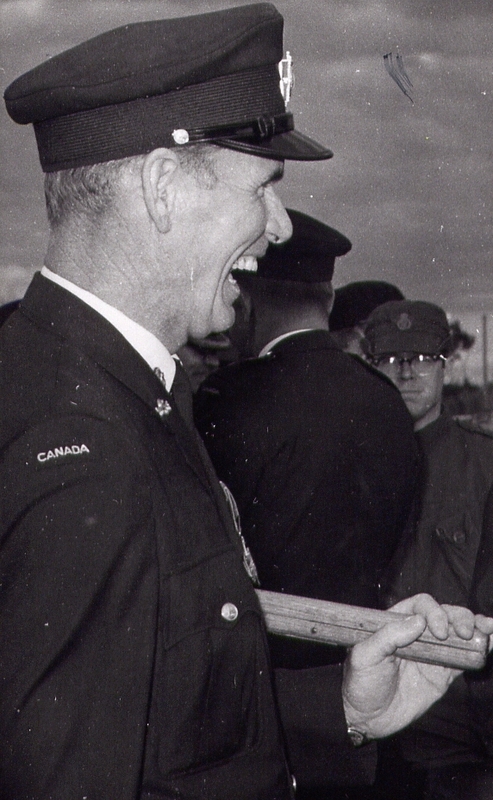 —RSM JJT McManus, CD, Cdn Gds, at the conclusion of the Regimental Parade, Royal Canadian Regiment, 12 October, 1971. 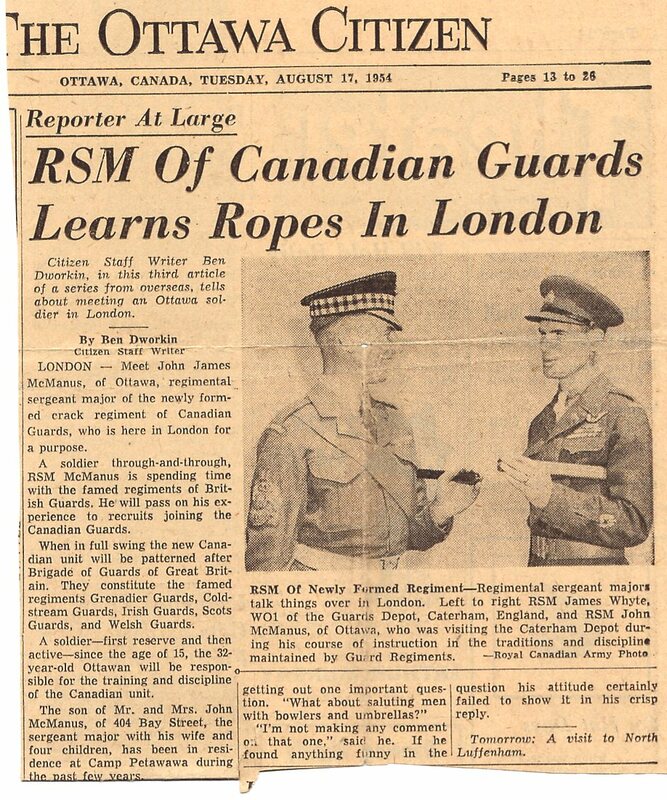 In June 1961, RSM McManus was appointed the College Sergeant Major of the Royal Military College of Canada in Kingston, Ontario (a position now known as the College Chief Warrant Officer) and continued to serve with distinction. RMCC provided RSM McManus with the opportunity to provide wartime and military field experience as well as significant opportunities for learning to the Cadet Wing and primarily the Cadet Wing Officers. Mr. McManus modeled a hands-on approach to learning. 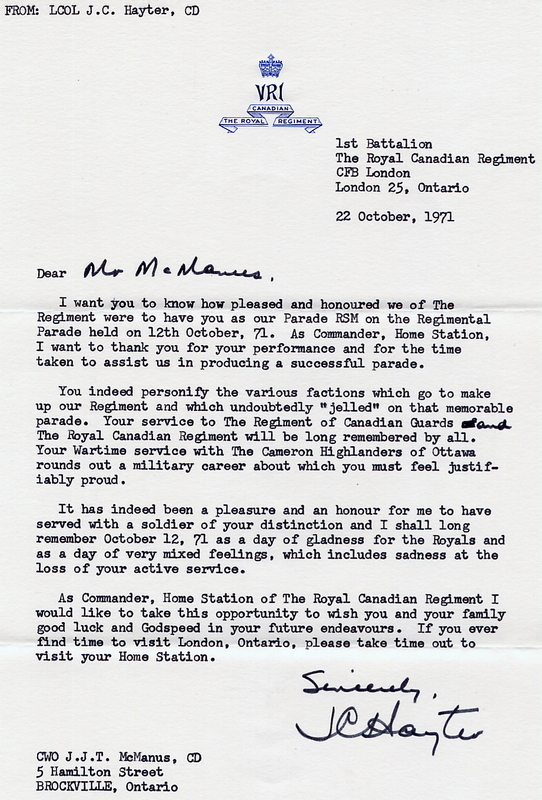 When the Regiment of Canadian Guards was placed on the Supplementary List in June, 1970, RSM McManus transferred back to the Royal Canadian Regiment. Mr. McManus continued in this role at RMCC until August 1971, at which time he took his retirement from the Canadian Forces, after serving Canada for over 33 years. He is one of the longest-serving College Regimental Sergeants Major in the history of the Royal Military College of Canada. 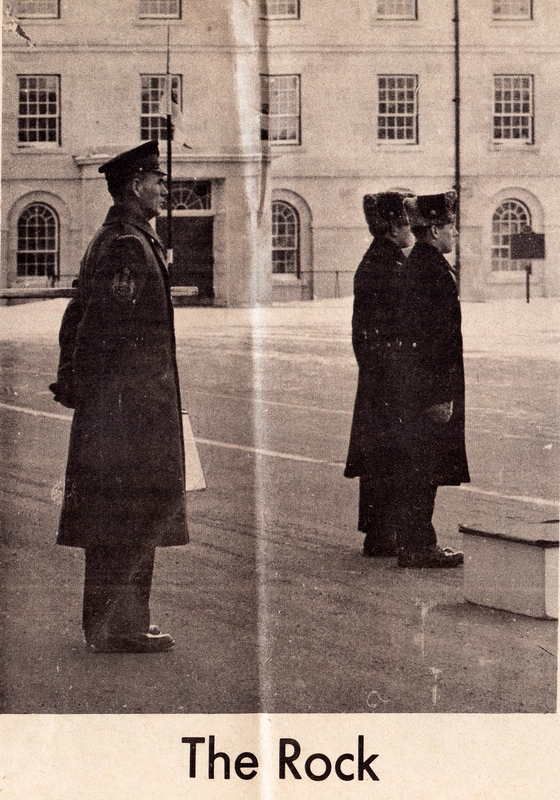 —Front Page of “The Marker” (The Royal Military College of Canada Cadet publication, Twenty-first Year, No. 5 – now called “Precision”) with RSM JJT McManus, CD, Cdn Gds, (“The Rock”). The Stone Frigate is in the background. In August, 2006, Mr. McManus was invited back by the Commandant of the Royal Military College, Brigadier-General Joceyln Lacroix, CD to update Mr. McManus on the challenges and opportunities facing the College, and how he and the military are responding so that the Royal Military College remains a relevant, respected, and prosperous institution of higher learning and military excellence. Mr. McManus was also provided with the opportunity to meet and address the College’s Officer and Non-Commissioned Officer staff. On that occasion, Mr. McManus was accompanied by his wife, Mrs. Sylvia McManus, and his twin sons, Mark and Antony, and Mark’s wife, Mrs. Odette McManus. On September 24, 2016, the McManus Family donated to the Royal Military College of Canada RSM McManus’ Regiment of Canadian Guards ceremonial sword, along with his career medals & decorations, and other military memorabilia related to RMCC. On October 22, 2006, Mr. McManus and his family attended an event sponsored by The Embassy of Iceland and the Cameron Highlanders of Ottawa, to pay tribute to Canadian soldiers who served in Iceland during World War 2, and Canadian soldiers of Icelandic descent that fought in both World Wars and the Korean War. 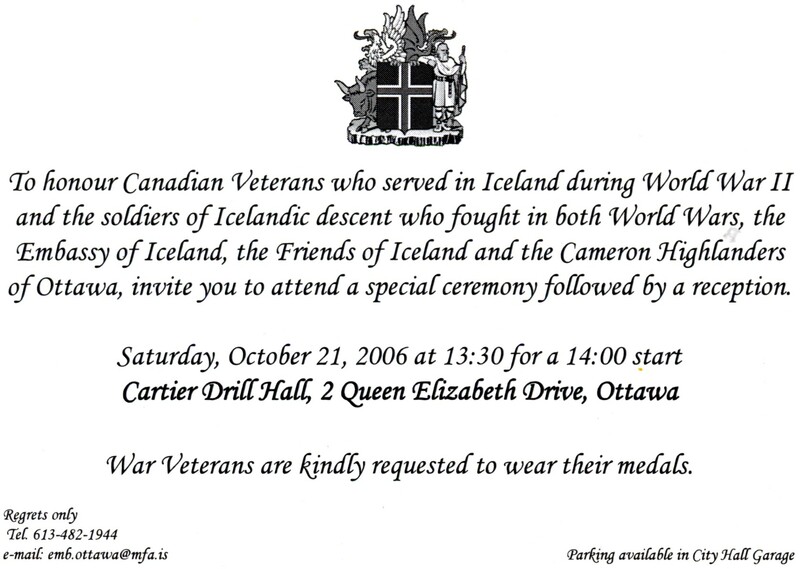 The occasion was the ceremony at the Cartier Drill Hall, in Ottawa, October 21, 2006, where the Friends of Iceland, The Embassy of Iceland, and the Cameron Highlanders of Ottawa honoured the arrival in Iceland, in June, 1940, of the Ottawa Regiment along with Les Fusiliers, Mont-Royal, the Royal Regiment of Canada, all arriving by July 1940. Markús Örn Antonsson, the Ambassador of Iceland to Canada presided at the ceremony. Mr. McManus commenced a civilian career in 1974 with Black and Decker, Limited at their plant in Brockville, Ontario, responsible for Plant Protection and Maintenance, retiring in 1987 after a successful thirteen-year second career. In 1972, the incoming Commanding Officer of the local primary Canadian Forces Reserve regiment, The Brockville Rifles, Lieutenant-Colonel H. E. S. Grout, CD, approached Jim to head-up the Royal Canadian (Army) Cadet Corps Number 113, which the regiment was going to reactivate and continue to sponsor. RC (Army) CC 113 , tied as the ninth oldest cadet corps in Canada (July 2, 1904), was formerly co-sponsored by The Brockville Collegiate Institute & Vocational School and The Brockville Rifles, In 1968, there had been a change in designation, when cadet corps activity was withdrawn from the Ontario high school curriculum by the provincial government and the Corps became inactive for a few years. The Corps is now sponsored by Branch 96, Royal Canadian Legion with The Brockville Rifles being its Affiliated Regiment. 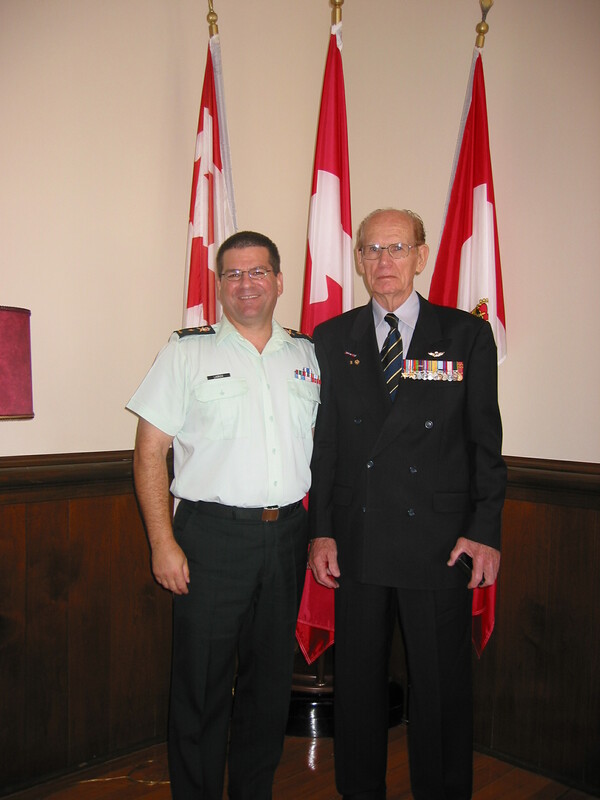 Jim was commissioned as an officer in Canada’s Reserve Forces and served in the role of the Corps Commanding Officer from 1972 to 1976. In this endeavour, he was supported by his wife, Sylvia, and his twin sons, Mark and Antony, who also were commissioned as officers in the Canadian Armed Forces Reserve, along with other members of the Cadet Instructor List, Roger Hum (a local school teacher and John Jodoin, a constable with the Brockville Police Service). Jim passed away peacefully at home in Brockville, Ontario, surrounded by his Family on Saturday March 20th, 2010. He was in his 89th year.